DENVER -- Three Denver police officers have been suspended after three separate incidents this year of arrestees being forgotten in temporary holding cells overnight. Policy requires desk officers to check on people detained in holding cells every 30 minutes and to notify a supervisor if someone has been held there for more than an hour. The holding cells are supposed to be temporary stops for arrestees before they can be transported to the city jail. Yet one woman, in custody for an unpaid traffic ticket, sat in a sparse police department holding cell for nearly 13 hours. Handcuffed to a bench, Victoria Ugalde could not reach the toilet for much of the time and had no option but to urinate on the floor. "They forgot about me," Ugalde said. "I was looking in the camera, I was [saying] 'Can anybody help me?' And then, nobody." The desk officer who was supposed to check on Ugalde admitted he failed to notice she was there because he was wrapped up in reading a book, titled "Emotional Intelligence 2.0." He served a three-day suspension and is back on the job. The seemingly strange scenario played out twice more this year, and the police department is weighing policy changes to prevent it from happening again. Victoria Ugalde had her driver's license revoked after a DUI arrest in 2003. She said she quit drinking after that arrest. In 2013, a police officer caught her driving with her license still revoked and cited her. Ugalde admits she did not go to court because she could not pay, so the judge issued a warrant for her arrest. "Everything started with one traffic ticket," Ugalde said. She said she was riding as a passenger in a car stopped by police in January when police discovered she had the 2013 warrant and took her into custody. "I was thinking, in three hours I'm going to be in the Denver jail," Ugalde said. 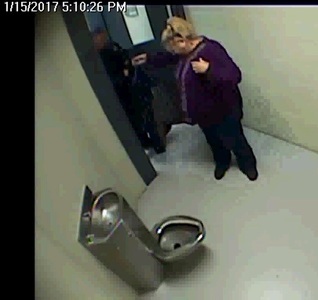 Video from inside the police precinct shows an officer leading Ugalde into a holding cell and telling her to remove her coat, sweatshirt, and shoes. The officer told her she'd have her things back in a "few minutes." The minutes turned to hours. A van from the jail arrived at 6 p.m. but did not take Ugalde because it apparently did not have room. Deputies told the desk officer they would return for the remaining inmate, and when that officer's shift ended at 8 p.m., she said she told the next officer the woman was still waiting in the holding cell. Policy requires officers to document checks on inmates in holding cells every 30 minutes. Yet the next two officers who worked the front desk apparently did not check on Ugalde once. Officer Sean Kelly began working an eight-hour shift at 9:30 p.m. and said he was never informed about anyone being detained at the station. By then, Victoria Ugalde had been locked in the holding cell for more than four hours. She said she was becoming desperate in the cold cell, unable to remove the cuff around her wrist. "The only thing I wanted was [someone] to help me use the bathroom. Nobody was there," Ugalde said. She ultimately decided to pull down her pants and urinate on the floor on the bench around 11 p.m., close to six hours after she entered the holding cell. When she describes the "trauma" of that long night in the cell, it is clear the indignity of being kept chained away from the toilet is what scars her the most. "I was crying. I cried a lot. Because I had to use the bathroom right there," she said. "I started praying and talked to God and he told me, 'I'm here ... don't worry, I'm with you.'" 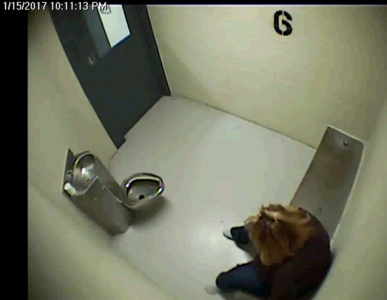 By 12:21 a.m., video from inside the cell shows Ugalde managed to slip her hand from the handcuff. Two hours later, still waiting for someone to notice her, she curled up on the floor in an attempt to sleep. Ugalde said she was so afraid of police catching her with her hand out of the handcuff that she later slipped it back in. At the district's front desk, Officer Sean Kelly sat with a grid of video monitors that included a feed from inside the holding cell. He later said he never noticed the woman in the cell. It wasn't until 5:30 a.m. that an officer actually made a "routine" check of the holding cell and discovered Ugalde still sitting there. "I told him, 'Thank you for helping me. God knows that he sent you to take me to the other jail,'" Ugalde said. Authorities finally transported her to the jail at 6:22 a.m., more than 13 hours after police took her into custody for an outstanding traffic citation. The Denver Department of Safety suspended Officer Sean Kelly for seven days, then later reduced the punishment to three days. The other desk clerks who worked during Ugalde's detention received written reprimands for failing to notify a supervisor she was detained for more than an hour. "With the trauma that I have in my mind, every time I see police, I get scared and start praying," Ugalde said. Victoria Ugalde served 54 days in jail for the traffic violation. She said she has no anger toward the officers who never checked on her, and she only hopes they never do it again. But after her ordeal, police forgot two additional people in holding cells overnight. The Department of Safety's deputy director said district desk clerks were reminded of existing policies about monitoring holding cells after the January incident. But less than a month after officers failed to check on Victoria Ugalde overnight, it happened again to another woman. On Feb. 7, police arrested a woman who was the passenger in a vehicle that evaded police after discovering she had multiple warrants for her arrest. They took her to a district holding cell, where she remained for nine hours. The desk officer in that case, Officer Ramone Young, served a 10-day suspension. He was working desk duty after prior suspensions for inappropriate contacts with women on duty. On July 10, police arrested a man accused of domestic violence and brought him to a holding cell. That suspect entered the holding cell at 7:55 p.m. and was not taken to jail until the next morning at 5:30. Records show the man was restrained for nearly 10 hours and, like Ugalde, did not have access to the toilet. The desk officer in that case, Officer Brian Klaus, served a six-day suspension. The second-in-command at Denver Police said the repeated incidents don't necessarily indicate a broader problem. "Since 2014, we've had 302 discipline cases. Of those 302, three involved what you're talking about here. And they all happened this year," said DPD deputy chief David Quinones. "Obviously it's a concern for us, it's not the standard of service that we expect from our officers, and those three have been addressed." Quinones said the department will examine whether more training or new equipment is needed in the wake of these incidents. "Why it happened, I don't know. We've stopped, we've pulled everything together, every district station's policies, and the planning unit here will review it. We'll look at best practices across the country. If it's a matter of we need better equipment, we'll look at better equipment. But the expectations are pretty simple: keep an eye on the prisoners in our custody," he said.